Hockey Plumber: The Islanders Win! In our "spotlight" on the New York Islanders and their Lighthouse project, we pointed out that the local buzz surrounding the Isles' number one overall pick, their manufactured mystery about the selection and planned draft party was well orchestrated by the team. 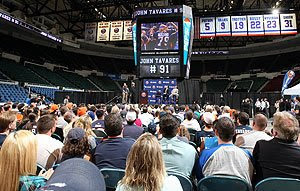 Since that time, the Islanders thrilled their fans at said party by selecting John Tavares, had encouraging meetings regarding the Lighthouse project and yesterday, held a welcoming party for the new face of the franchise. Read the whole story and see the videos on the Isles website here. “Today feels like we are celebrating the rebirth of the New York Islanders Franchise,” exclaimed Islanders broadcaster Howie Rose. And the press conference to welcome John Tavares was underway. Cheers rang out from the more than 500 fans in attendance at Nassau Coliseum Wednesday afternoon, as the Islanders formally welcomed their No. 1 overall draft pick. With the scoreboard lowered to the floor, fans dressed in No. 91 Tavares t-shirts and jerseys, gave Tavares a standing ovation. There were even a few fans who were wearing t-shirts that had Tavares’ likeness emblazoned on the front." The Islanders had 500 fans show up to a Wednesday afternoon presser! There were games last season where 500 fans was not a bad turnout! This is a franchise with a glorious history. They were a post-expansion dynasty in the 80's, but faded faster than a Devo cassette after the last of their star players moved elsewhere. Even if years down the road, Tavares is more like Alexandre Daigle than Sidney Crosby, the Islanders may very well be playing in front of thousands of frenzied faithful, in a new arena because they had played their cards right in 2009! Again, good for them and good for the NHL.